Cwm Ty Coed is run by ourselves, Jon and Sarah, and set on an established 30 acre smallholding. We have many years of tipi experience and creatively provide comfortable and workable facilities for our guests; all with those little finishing touches which make all the difference. We are keen cooks and gardeners so it is often possible to buy home produced vegetables, fruit, jam and chutney. The smallholding is home to a small flock of rare breed sheep who cheerfully perform their lawn mowing duties. There are often lambs to see and campers can also help themselves to fresh eggs from the hens in the camping field. For latest availability and best prices for Cwm Ty Coed, please use the Date Search above. 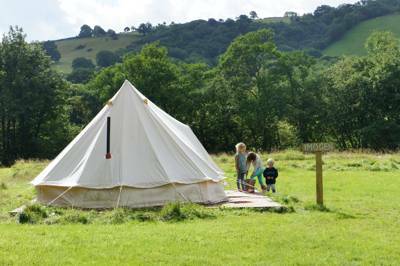 All tents/tipis have wooden floors, beds, bedding (including extra blankets), storage, solar lighting and candle lanterns. 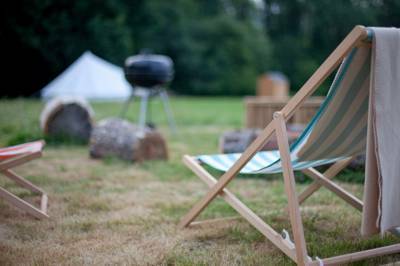 Tipis have a large central fire bowl and bell tents have a log-burning stove. 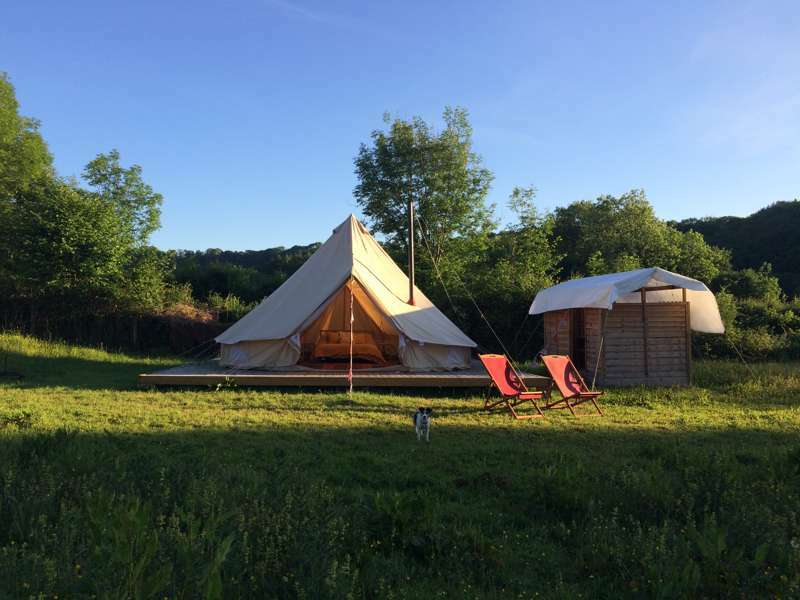 Each pitch comes with: private kitchen fully equipped for camp cooking & dining, outdoor fire pit, log seating, chiminea, barbecue, picnic bench and deck chairs. 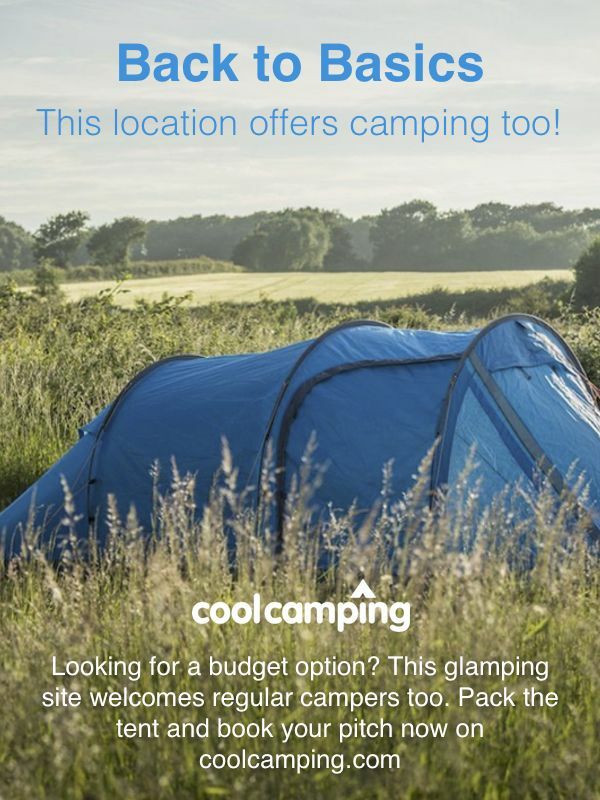 Shared facilities include: gas powered showers in the camping fields & compost toilets. Large communal wooden cabin with cosy log burner, sofas, small kitchen (with cooker), table tennis table, nearby zip-wire and electricity for charging phones etc. Occasionally, on request, an outdoor ‘cinema’ in the woods can be arranged with straw bale seating, little candlelit tables and large fire pit. A large basket of logs is supplied for both indoor & outdoor fires. There’s also a canvas marquee (seating around 50), which is available for hire. Kids can do their own weaving at the free National Woollen Museum (029 2057 3070), or visit the splendid National Botanic Gardens (01558 668768) with its wide-open spaces mean the gardens never feel crowded. However there’s a lack of cover, so if rain is forecast - come prepared! Take a trip to the ancient standing stones of Myndd Llangyndeyrn, a Site of Special Scientific Interest (SSSI) that attracts an abundance of rare birds and uncommon invertebrates. More natural kicks await at the magnificent gardens and stately house at Aberglasney (01558 668998). Explore the breathtaking Cardigan coastline with a dolphin watching boat (01545 560032) out to Cardigan Bay or a day on some of the region's loveliest beaches – Mwnt and Tresaith being two of the most popular. You’re also well located to access the endless array of beauty at the Pembrokeshire Coast Path or the Brecon Beacons. Carmarthen Market (01267 228841) sells local cheeses and Carmarthen ham, a serious local rival to the Parma variety. You can also pick up your sausages and burgers for that BBQ round the fire-pit. There’s a couple of decent pubs in nearby Pontyberem: The New Inn (01269 871152) has good pub food and a good range of ales, The Smiths Arms (01269 842213) is also a good shout and a bit closer to home in Llangyndeyrn is The Farmers Arms (01269 871022), a traditional local pub serving evening snacks. For all you vegetarians, the Afon Duad Inn (01267 281357) in Cwmduad, offers a good vegetarian menu as well as a selection of sturdy Welsh meat dishes. The Black Lion (01545 561144) in New Quay was (amongst many, many others) a regular watering hole of Dylan Thomas. For a sunny-day treat, the award-winning Italian ice-cream at Conti's (01570 422223) in Lampeter has to be tasted. Approaching Carmarthen from the M4: continue towards the town on the A48, about two and a half miles before Carmarthen there is a sign for Dyfed Powys Police headquarters and the A48 starts to go down a long hill. At the bottom of this hill you should take the left turn. From the west: take the A48 towards Swansea and take the first right turn off the dual carriageway. Follow this road for 100m then on the bend take the right turn in the direction of Cwmffrwd. This road will take you through a farm and approximately half a mile further on you can find the track to Cwm Ty Coed on the left-hand side. Carmarthen railway station (less than 2 miles away) is managed by Arriva Trains Wales (0845 606 1660), who operate most of the passenger trains serving it. First Great Western (08457 000 125) operates a limited service to London Paddington (usually one train each way daily, with additional services on Sundays). 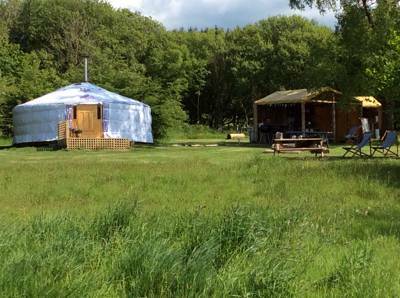 5 bell tents, 2 tipis and 1 yurt are available. 1 double/treble pitch and 6 with private kitchen and outdoor fire pit.